The student must know the basics of place value, that the number 77,582 is a shortcut for the addition problem “70,000 + 7,000 + 500 + 80 + 2”. This place value concept is more subtle, but it’s extremely important: 7,500 can be thought of as “7 thousands and 5 hundreds”, or as “75 hundreds”, or as “750 tens”, etc. The student must understand how division is related to multiplication and recognize the two basic models of division — sharing and measuring. Here is a clear explanation: Division (Parker & Baldridge). A student does not need to have fully mastered the multiplication facts before studying long division. Let him keep a times table chart handy for reference, if needed. 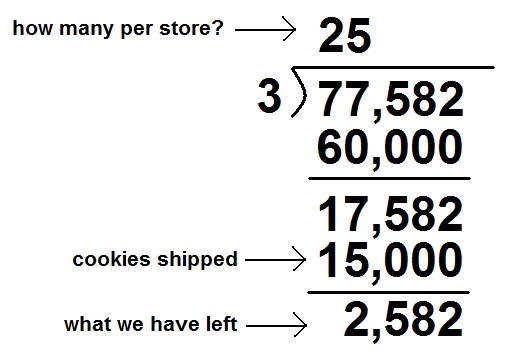 I use a “cookie factory” metaphor to help my students understand the long division algorithm. Pretend you are running a cookie factory, and you produced 77,582 cookies today. Most textbooks teach the long division algorithm with relatively small numbers. By working with a large number instead, we force our students repeat the pattern of steps several times, fixing them in memory. So, you produced a huge batch of cookies. You need to ship them out to 3 stores — and to be fair, each store must get the same number of cookies. How will you split the shipments? Remember, there are 3 stores, and each must receive the same amount. How many cookies can you send to each store? Obviously, you want to pack the cookies in the biggest shipments you can. That is the most efficient way to send them, and it will cost the least in shipping fees. Can you send a whole truck (or two or more trucks) to each store? 1 truck per store 3 stores = 3 trucks. 2 trucks per store 3 stores = 6 trucks. We have 7 truckloads, so we can send 2 trucks of cookies to each store. We will “build” our answer on top of the long division sign, so that we have room down below for subtraction. After all, we can’t send out the same cookies more than once. We have to mark them off as soon as we send them. Remember, each truckload is 10,000 cookies. Be sure the “2” goes in the correct place value column. Below, subtract the 60,000 cookies you just sent out. Don’t use a shortcut yet! Later, when you are sure the student fully understands each step, you can explain the “subtract, bring down” shortcut. You may even want to teach short division. But for now, until the process is mastered, you need to emphasize the full 60,000 with all the zeros. We had one truck we couldn’t send (since you have to send the same to each store). So let’s open it up and unload those 10 pallets, adding them to the other 7 pallets we have ready to go. That makes a total of 17 pallets. 1 pallet per store 3 stores = 3 pallets. 2 pallets per store 3 stores = 6 pallets. 5 pallets per store 3 stores = 15 pallets. That is the best we can do. We can’t send those last 2 pallets to any store, or the others will feel cheated. Remember, we are building the answer on top. Add your 5 pallets per store as a “5” in the thousands column, and subtract those cookies from the total we still need to ship out. Now we open the remaining pallets and send out cookies by the case load. 2 pallets = 20 cases, plus we had 5 cases already. 25 cases. How many per store? 1 case per store 3 stores = 3 cases. 2 cases per store 3 stores = 6 cases. 8 cases per store 3 stores = 24 cases. 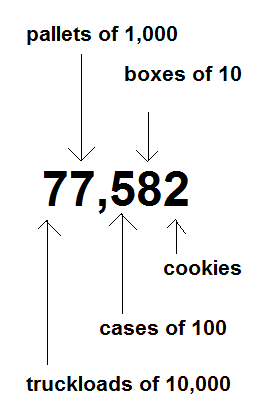 We can send 8 cases per store, which will use up 2400 more cookies. Remember, write how many each store gets on top (in the correct place value column! ), and take away the cookies you sent out. Okay, we had one case left, which is 10 boxes of cookies. Plus we had 8 boxes already, so that’s 18 boxes we can ship. 1 box per store 3 stores = 3 boxes. 2 boxes per store 3 stores = 6 boxes. 6 boxes per store 3 stores = 18 boxes. We can ship 6 boxes of cookies to each store. Remember to subtract the 180 cookies that you send out. That brings us finally down to the level of individual cookies — of which, in this problem, we can ship zero per store. And if you get that far and have a couple of cookies left over, I’d say it’s snack time! While the shipping metaphor helps the student understand the value of working with large chunks first and gradually moving to smaller amounts, such non-standard usage could become a stumbling block if we keep it up too long. 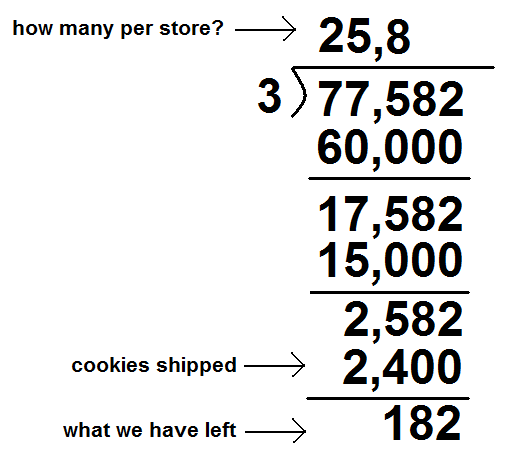 After two or three problems, I switch from the shipping terminology to talking in terms of place value: How many hundreds (or thousands, or tens) per store, rather than cases and pallets. This process works the same with large divisors as with single digits. 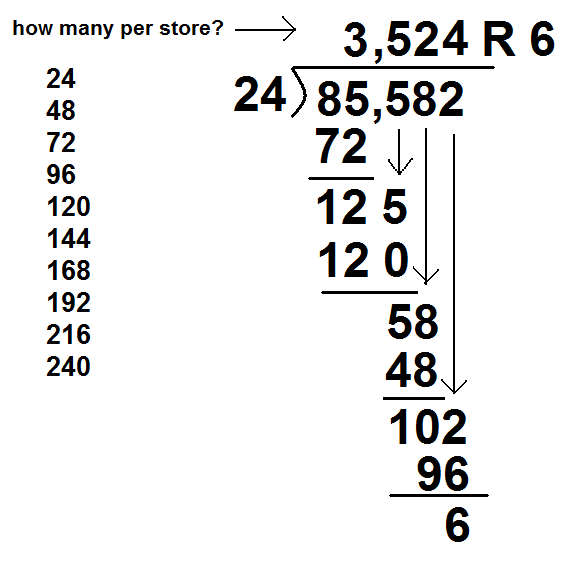 The only difficulty in dividing by a larger number, such as 24, is that the “how many per store?” step is harder to do in one’s head. When a student has reached this stage, there is no need to write all the place value zeroes and subtract every column each time, as we did in the beginner problem above. Instead, we work with just the relevant columns and use the “bring down” step, which is equivalent to unpacking the next smaller shipping unit. Drafting tip: Notice how I use arrows to keep my place value columns lined up. This is especially useful when the problem involves a zero in the quotient, which students so easily miss. As the answer is built up column by column, the student must place a number up top for every arrow before bringing down the next digit. Any math problem with multiple steps offers multiple places for a small error to mess up everything else. In my case, the error was . Oops! Even though I proofread the text of this article multiple times, I missed the arithmetic mistake. That reminds me: When you are working this level of problem with your students, limit them to just a few problems per session. It is so easy for anyone to let a little mistake slip through, but too many wrong answers in a row (each due to a different small error) can discourage a student. It’s much less frustrating to work only a couple of problems, search out the errors, and correct them until they are perfect. Thanks. I’m going to print this out and study it and then have my boy study it (the one that should be past it by now). This is such an excellent reinforcement of place value and it makes so much sense out of the division algorithm. I find that many middle school students have a very limited understanding of the place value system and multiplying/dividing by 10. I think your lesson would set the stage for converting among any other unit of measurement. Thanks for the great idea!! Pingback: The Cookie Factory Guide to Long Division « Let’s Play Math! I find it very helpful to use grid paper (graph paper, with squares that are at least 1cm in size so the younger ones have enough space to write one digit per box clearly). That keeps things lined up much more nicely than most kids are able to do with other paper. and a link back to this post. I especially like your Step 1 and Step 2, which I would consider mental math rather than long division. It’s a good way for students to get used to the long division symbol (the goesinta?) and to writing the answer on top. Once the student gets to your Step 3, writing the subtraction and bringing down the next digit, I think the problems need to be big enough that mental math isn’t easy. 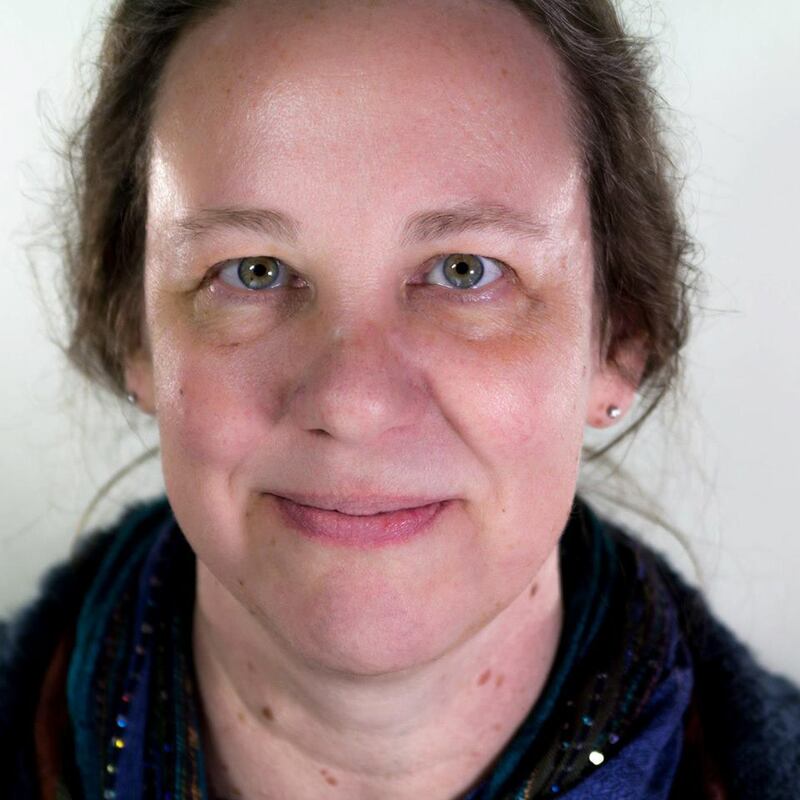 My kids get (understandably) impatient with writing steps that they could do in their heads, so the problem needs to be big enough that they can’t keep it all in mind. That gives them a reason for writing it out. And, as I said above, working with a large number emphasizes the repetitive nature of the algorithm. That might be just my kids, however. Your progression is logical, and the little steps will surely help people who are not so comfortable with math. Drats! And I proofread this a dozen times. 😦 How did I manage to miss that? Thank you for pointing out the error, Alex! Re Advanced Long Division sum above. It’s wrong….85 minus 72 makes 13 not 12…! Jesus wept. !